What if You Win a 60-Thousand-Dollar Slot Machine Jackpot? Are you ready? Are you ready to win a 60-thousand-dollar slot machine jackpot? Are you sure? From making the bet to income tax preparation, I’ll go over everything you’ll need to do. One of my biggest issues with slot machine casino gambling has been the surprises, like winning an unexpectedly large jackpot. Of course, it’s possible to win big jackpots. We all know that’s possible, so why not be ready? Here’s what to expect if you win big. I’ve won 90 taxable jackpots in 9 months in a U.S. state where slot machine jackpots became taxable at $1,200. Of those, three exceeded $10,000. On average, 1 in 30 jackpots exceeds $10,000. This excludes the $40,000 cash option I got for winning a car at the end of those 9 months. My first big jackpot was for $27,000. So far, this is my largest jackpot won playing slot machines. I won it early on Saturday, December 21, 2013, at 5:40 a.m. at Horseshoe Cincinnati, since purchased and renamed JACK Cincinnati Casino. I won this $27,000 hand pay on a Red-Blue-White Seven’s slot machine in the high limit slots room. I’d made the maximum bet on this $10-denomination, 2-credit slot machine. I was checking to see if I could cycle my bankroll on this slot machine. I was testing to see if it was a winning slot machine. I’d just about decided I was wasting my money because it wasn’t showing any evidence of bankroll cycling when it hit. I remember the moment clearly. It was very early in the morning. I’d started my session at 4 a.m. and had already won a small hand pay. I remember seeing someone win their own hand pay behind me, but couldn’t see how much. 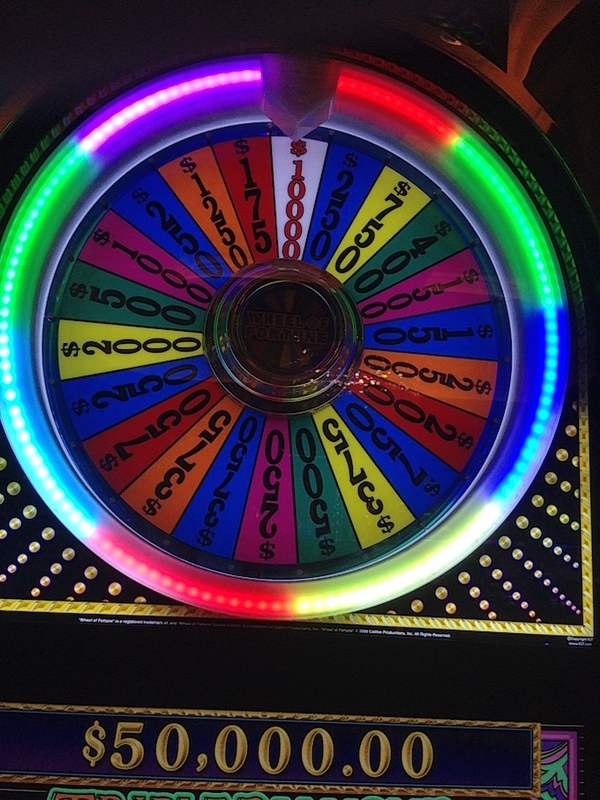 A floor manager was there with the slot attendant during their hand pay, so it must have been over $10,000. As the floor manager and slot attendant walked away after the hand pay, they began walking by me. 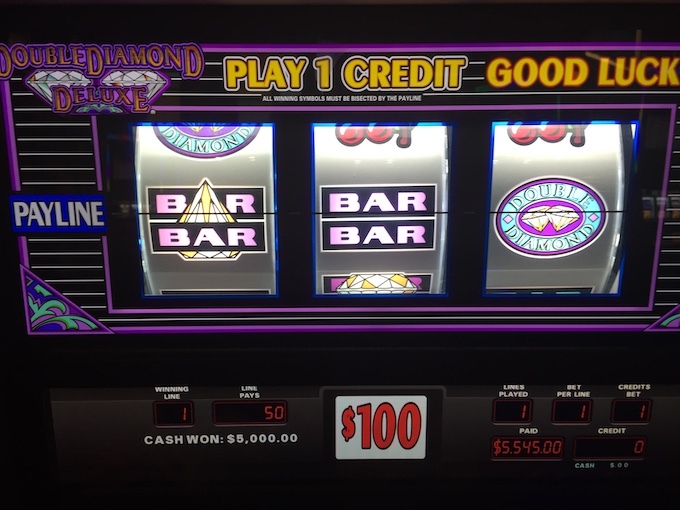 Just as they approached, my $27,000 jackpot hit. I looked down, saw the 2,700-credit hit, looked up at the floor manager looking at me, and swore. That was embarrassing. I don’t usually swear. But, at that moment, I felt the need to do so. I swore right while looking the floor manager in the eye. He kept walking, now with a frown. I called out to him, to explain. “Excuse me! Sorry about that! I didn’t mean to swear, but I just won a jackpot. A really big jackpot!” They came back. Right about then, 30 seconds after the slot machine hit, I basically went into shock. Since I’d started gambling again after nearly 10 years, my biggest jackpot was $5,000. I’d won it three times over the last month, since I’d started gambling, and every time was hard on me. But now, I’d won more than 5 times that. It wasn’t easy. I remember telling the floor manager how unreal and dreamlike it felt. I even asked the slot attendant to pinch me. And, after the hand pay, I had trouble deciding what to do next. Should I just go on with my day? Should I stick to the plan I had had in mind? Or, was my plan of gambling all day ruined? Hint: You’re done – go home. Can you imagine how I was feeling? I know some of you can indeed imagine it. I know because some of you have won even bigger jackpots while playing slots. Are you ready to win a big jackpot the next time you play a slot machine? To be ready, you’ll need some essentials like your government-issued I.D. But there are other ways you’ll probably want to be ready. You’ll need the government-issued I.D. to receive a taxable jackpot at a casino. That’s essential. If you don’t have it with you, nice casinos will let you go to your car for it. But, I don’t think you should count on the casino letting you go home to get it. If you’re anything like me, you might find yourself not quite yourself after winning a big jackpot. To be ready, think it through in advance. Make yourself a plan. Then, if/when it happens, all you need to do is remember the plan. It doesn’t have to be a complicated plan. Just ask yourself this simple question. After you get the hand pay, will you stay or will you go? There will be more decisions to make, but that’s really the most important one. As I tell my students, which as it happens I did again earlier today, I don’t care what your plan is. I care that you have a plan. We’re not having a career discussion right now, but I think you get the point. Will you leave the casino or will you make a night of it? Personally, I’d leave. I’d leave as soon as I could. I didn’t know that in advance of my biggest jackpot, but I do now. That’s my plan. What’s yours? So, imagine you’ve just won your biggest jackpot ever. And, you have your I.D. You might even have a player’s club card so your personal information is on file with the casino. Next up is the hand pay and more decisions. If you’ve never won a taxable jackpot before, no matter what size, the hand pay process is straight-forward. You win a jackpot. The machine locks up. A slot attendant comes. You do paperwork. Someone else shows up to verify the jackpot. Finally, you get paid. As it happens, I’ve already explained the hand pay process when winning a taxable jackpot playing slots. I called that article How Do Slot Machines Pay Out Taxable Jackpots, which is also my podcast episode #7: How Do Slot Machines Pay Out-California Slots 2017. But, there are some slight changes to this process when winning big jackpots. In most states, jackpots of $10,000 or more require that the jackpot verifier is a floor manager rather than another slot attendant. Tip #1: You can tip the slot attendant, and in my opinion should, but you can’t tip the floor manager. If they say it’s okay, the floor manager will take a tip to put into the group tip jar for all the slot attendants. But, typically, floor managers can’t receive tips. Tip #2: This is your chance to meet a floor manager. It’s a priceless opportunity. Get to know them. Make friends, if you can. Floor managers know a lot more about what’s going on in a casino than slot attendants. Ask questions. Be nice. Thank me later. You do have another choice to make, however. For jackpots just over the taxable limit but under $10,000, casinos will provide banded stacks of $5,000 when you ask for cash instead of a check. 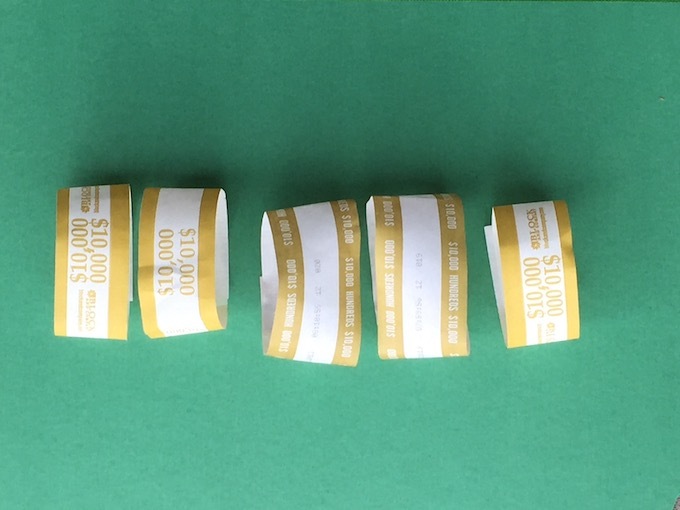 Other casinos only provide banded stacks of $10,000. Either way, for a large jackpot where you ask for cash, you can expect banded stacks (sometimes called bricks) of hundred-dollar bills. Personally, I have found it’s nice when a slot attendant counts out 100-dollar bills in my hand. Professionally, I advise you to take most or all the jackpot as a check. That is if your plan includes requesting some or all your taxable jackpot in cash. It’s really your choice, however. What’s your plan, again? If you do request cash and end up leaving the casino without spending it, I should mention what happens at a bank when you go to deposit $10,000 or more in cash. It’s just the same as any other cash deposit, except for the Currency Transaction Report (CTR). The CTR is a reporting requirement for U.S. financial institutions regarding all cash deposits, withdrawals, and currency exchanges of $10,000 or more. When making a deposit of at least $10,000, it will be reported to the Financial Crimes Enforcement Network (FinCEN) within the U.S. Treasury Department. FinCEN was created in 1990 and became its own bureau under the USA Patriot Act passed in 2002. In part, it monitors and analyzes financial transactions for illegal transactions. This includes financial crimes related to money laundering and corruption. I don’t think you have any cause for concern as earning money at a casino isn’t an illegal transaction. My lack of concern here hinges on understanding that big jackpots generate a W-2G tax form when won at a casino. So, if FinCEN does become interested, it wouldn’t take much for the U.S. Treasury to confirm the source of that much cash. Nevertheless, I thought you should know about the CTR. There is another aspect to accepting a lot of cash you should probably be aware of. In my mind, it’s slightly more important than the CTR. It’s this: How much cash can you carry? Let’s say you’re wearing a pair of jeans or trousers with typical size pockets. Let’s further say you’re not wearing a jacket or carrying any sort of purse. Finally, let’s assume all your cash is in $100 bills. Under those circumstances, how much cash can you carry without it being in your hand or sticking out somewhere for anyone to notice? With a wallet in one pocket and a mobile phone in another, I’ve been able to tuck away 200 $100 bills, that’s only $20,000, in all the pockets of a typical pair of men’s jeans. Let’s say you won a big jackpot which you accepted as cash and after taxes have $50,000 in your hand. What do you do with it? Yes, you can fill all your pockets with $20,000 of it. What about the remainder? Do you ask the casino to provide a brown paper bag, perhaps? I’ve been in this situation and faced this dilemma. Once again, make sure you have a plan in case you win. One final note about getting home. Feel free to ask the casino for security to walk you to your car. They’re perfectly happy to do so. Unlike me, try to remember where you parked your car. Take it from me, it can be surprisingly hard to remember that little fact when you’re clutching tens of thousands of dollars in your sweaty hands. One time I was sitting two seats away from someone who looked like they had never been in a high limit slots room at a casino. Do you know that look? Anyway, they looked both nervous and like they wanted to go. Suddenly, and it’s always sudden, they won a $4,800 jackpot. They just nodded to themselves and started hitting the cash-out button. Which, naturally enough, wasn’t working because the slot machine had locked up due to winning a taxable jackpot. I was just trying to be helpful. I imagine you know what happened next. “Taxes? Taxes? !” As they became more and more upset at me, I tried to disengage from the conversation. Luckily for me, the slot attendant arrived right about then to save me. Slot attendants are great. Seriously. I always remember how upset this taxable jackpot winner was whenever I work with a slot attendant. It is what I remember whenever I tip my slot attendant after winning my own taxable jackpots. So, if/when you win a taxable jackpot, you’ll be working with a slot attendant. I’ve already described what that is like. But, let’s discuss income taxes for a moment. If you win $10 at a casino, it’s taxable income. This gets confusing fast though, because what if you spend that $10 in the next few minutes without it ever leaving the slot machine? I’m going to avoid answering that as it really deserves its own article someday. What isn’t in dispute is what happens when the casino issues a W-2G income tax form reported directly to the IRS. If you choose to accept a taxable jackpot, then you will receive a W-2G. As an aside, some people can’t afford or otherwise don’t want taxable jackpots. For instance, my family friends Lois and Dave in my article Seminole Brighton Casino Florida Trip Report, also mentioned podcast episode #27 Seminole Brighton Casino-Minnesota Slots 2018, are from Canada. For them, any gambling income from their annual visits to U.S. casinos is foreign income and potentially subject to taxation by the Canadian government. Yikes! Apparently, as usual with income taxes, what to do is very individualized. My admittedly limited understanding is, and please don’t consider me as any kind of professional or expert with regards to international tax law, my Canadian friends can earn some income when gambling in the U.S. – but not a lot of income. 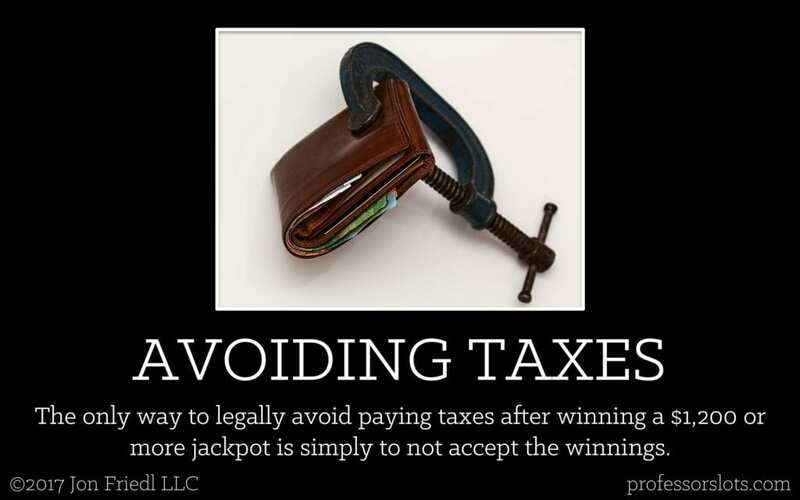 A $60,000 taxable jackpot may well be too much, too difficult, and therefore unwanted. Maybe. That’s funny, yes? It’s funny but true. Also, be aware the taxable limit is instead $600 in some states like Massachusetts, at least for the moment. Finally, there are the tax choices you’ll need to make when filling out the paperwork for the taxable jackpot with the slot attendant. A federal income tax withdrawal from your winnings is typically optional. State income tax withdrawal is very state-dependent. Local income tax withdrawal exists if the casino you are at is located within a city’s limits. Other withdrawals may exist such as a nonrefundable 3% tax on jackpots over $1,200 in Mississippi as imposed by the Mississippi Gaming Commission. For details on this, see my article for Mississippi Slot Machine Casino Gambling. If you keep good gambling records, it usually works out well to choose to not pay federal taxes. Why? Because keeping good gambling records means you’ll have gambling deductions to apply during your annual income tax preparation. If you don’t keep good gambling records then, frankly, you should start doing so. To help get started, here’s my article on Keeping Gambling Records for Tax Preparation and More as well as podcast episode #28 Gambling Record-Keeping-Mississippi Slots 2018. The danger of not keeping gambling records is having to pay income taxes when avoiding them, or getting a refund later, was entirely possible. Keep gambling records just in case you win a big jackpot. Make it part of your plan, okay? 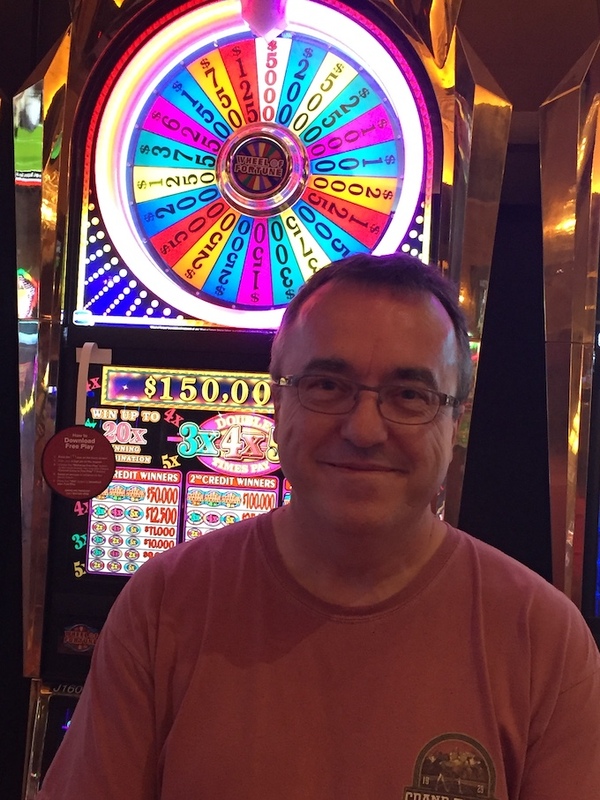 A few weeks ago, a fan of my website and podcast named Richard from Gainesville, Georgia, contacted me via Twitter after he won a $60,000 slots jackpot. I was proud of how well he handled it and told him so at the time. How he handled a big jackpot reminded me of what it was like. My first time, I didn’t do as well as Richard. So, I wrote this article so you can do better than I did and perhaps as well as Richard if you won a large taxable jackpot. What will you do immediately after winning a big jackpot? Choosing to leave or stay is the biggest decision here. Cash or check or both? If cash, consider how little you can carry in your pockets. Paying income taxes: Federal, state, local, and more are all possible. Or, there may be none. It mostly depends upon your state. Keeping good gambling records to potentially get income tax refunds. Or, without gambling records, not getting any of it back. Choose now. Previous: Reviewing Peter Liston the Slotz King’s Video Interview by ACG – As part of an ongoing review series, I am reviewing Peter Liston in his appearance in a YouTube video interview by the American Casino Guide. Peter, the Slotz King, is a professional gambler who plays winning progressive machines, whether slots or video poker and teaches others worldwide to do so with his successful business. Next: Top 9 Slot Tips by RunHorse (YouTube Video Review) – With top 9 slot tips by RunHorse, I review a 13-minute YouTube video from mid-November 2018 purported to offer a collection of slots tips. Of the 10 tips provided, some are duplicates while others are simply small variations of others. Several are useful. Others tips I’ve already provided as full blog articles months or years ago.